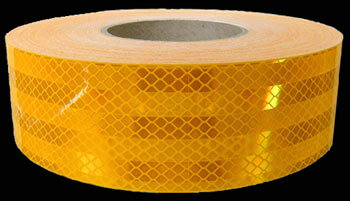 3M® 983 DIAMOND GRADE VEHICLE CONSPICUITY TAPE: This extremely reflective (TYPE V) adhesive tape is designed for all kinds of trucks (including fire trucks), EMS vehicles, school buses, trailers, bollards, and barriers. In daytime the colors are vivid. In darkness the reflections are brilliant. 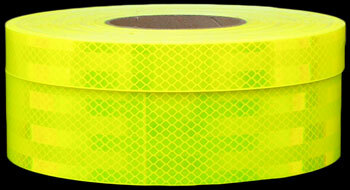 3M 983 diamond grade tapes have an acrylic and polycarbonate construction designed to stand up to the rigors of the road and improve the visibility of vehicles and trailers to approaching drivers. 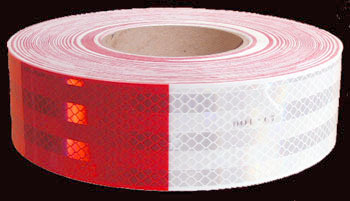 3M conspicuity tapes are six times brighter than conventional markings, reflect at angles approaching 90 degrees, are highly durable and non-corroding. 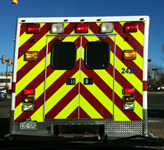 (Federal regulations require semi-trailers exceeding 10,000 lbs. 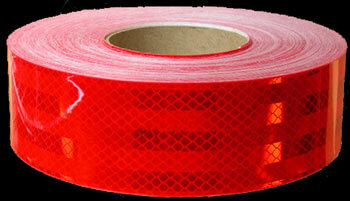 GVWR to have alternating red and white DOT-C2 approved 2-inch width conspicuity tape applied along at least 50% of their lengths and entirely across their back ends. 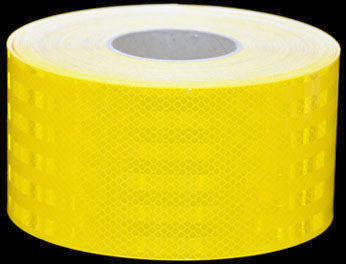 3M 983 tape is widely used on fire trucks, construction trailers, horse trailers, and RVs and is available in widths from 1 inch up to 6 inches in both large 150-ft rolls and shorter 15-ft rolls (multiples of 15-foot rolls will usually be sent as a continuous roll). 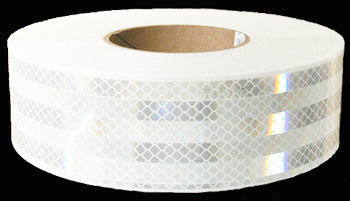 3M 983 conspicuity tapes are 14 to 18 mils in thickness (1 mil = 1/1000"), are edge-sealed, and are warranted for 10 years (see particulars at these links: Specifications for 3M 983-326 [for Truck and Trailers] and at: Specifications for 3M 983-71 [for School Buses]). (Instructions can be viewed at the following link: Application Instructions). 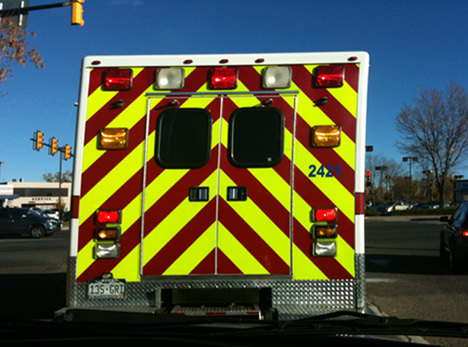 For NFPA 1901 fire apparatus compliance*, short and long rolls of red and fluorescent yellow-green colors are available in 4-inch and 6-inch widths below. DOT Conspicuity Tape 2" x 18"
"15.9.3.2: At least 50% of the rear vertical surfaces of the apparatus shall be equipped with a minimum 4-inch wide alternating yellow and red chevron retro-reflective striping sloping downward and away from the centerline of the vehicle at an angle of 45 degrees."